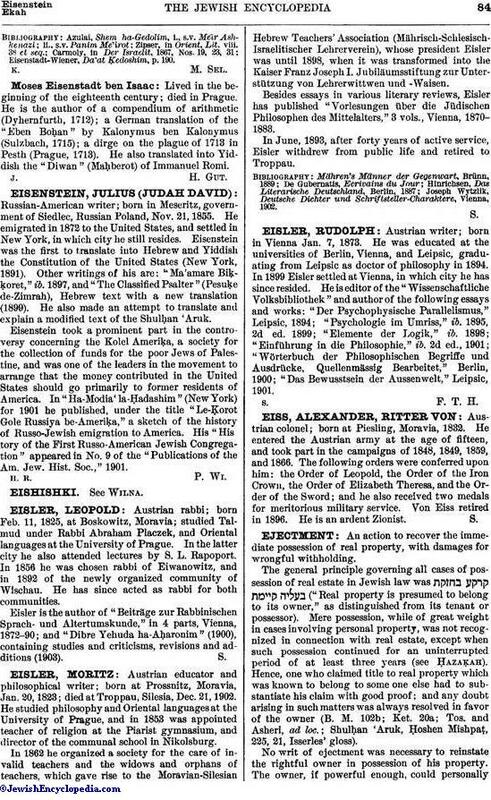 Austrian rabbi; born Feb. 11, 1825, at Boskowitz, Moravia; studied Talmud under Rabbi Abraham Placzek, and Oriental languages at the University of Prague. In the latter city he also attended lectures by S. L. Rapoport. In 1856 he was chosen rabbi of Eiwanowitz, and in 1892 of the newly organized community of Wischau. He has since acted as rabbi for both communities. Eisler is the author of "Beiträge zur Rabbinischen Sprach und Altertumskunde," in 4 parts, Vienna, 1872-90; and "Dibre Yehuda ha-Aḥaronim." (1900), containing studies and criticisms, revisions and additions (1903).